Best jeans ever!! They are dressy enough that people usually assume they are in fact dress pants. Nope. Denim. Super skinny leg is actually super skinny. Love it! Let me start off by saying I have been looking for black skinny jeans in my size for over 6 months. Every pair I had tried on up to this point were not flattering to my wide hips. I tried these on and I fell in love. These pants are super soft and versatile. Make sure you try them on because I am able to wear a size 18. AMAZING! Super comfy, very wearable jeans! Im thinking of buying a second pair I love them so much! I have two pairs of these jeans and am thinking about buying more. I only wish they came in additional colors. 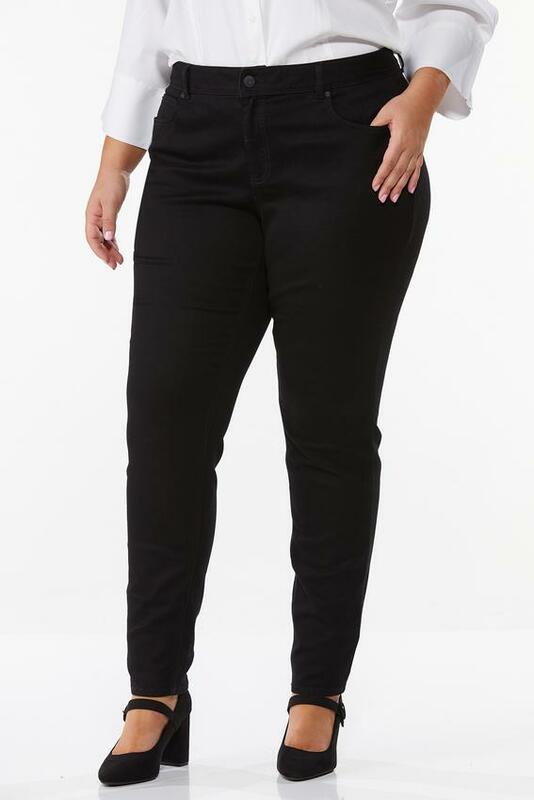 These are the most comfortable jeans I have ever owned - super stretchy and feel like leggings but are sturdier material. They look dressy enough that I can wear them to work and they dont look like casual wear. Because they are so stretchy, you might want to go down a size or try them on first. The two pairs I have are different sizes -- the one two sizes below my usual fits perfectly, the other one is loose by the end of the day. I bought these jeans in a size 20 and wore them to work the next day. Over the course of the day, the jeans really stretched out and became baggy skinny jeans. I have purchased these jeans in a size 18 and they fit perfectly. These are absolutely the best jeans I have ever found. I am now buying pairs 3 and 4. I wish they came in navy or another color, but as it is, they are perfect for wearing to work. They fit like jeans, but look dressy enough to get by at my no jeans allowed workplace. I agree with other reviewers - either try them on or order at least a size smaller. They are super stretchy so they will fit perfectly. So, I bought these jeans in the store, wear them to work today. They are the most comfortable best fitting Slacks I have had in years, had to look online for more. I also wish they came in other colors & maybe a boot cut. I will be buying at least one more maybe several more pairs. I am a size 28, so finding real slacks that dont lose their shape by the end of the day is very difficult. I am well pleased and I have been loving Cato for the past several years, always can find something that suits my taste and size & budget. These are by far the most comfortable jeans I have ever owned. Well worth every dime. I ordered both colors. I do wish they had more colors. Shipping was much faster than I thought it would be also. I thought these would look awful because Im knocked kneed and fat, but they actually look and feel pretty darn good. I wish they came is colors too. Excellent and comfortable pair of pants. I think I will buy another pair because they are just that comfortable and decent. Material soft and stretchy. I just wish they made them in a navy blue and khaki or brown. Would wear these to teach children every day in the various colors. PLEASE get other colors. I love these jeans. I have 4 paid of them. Wish they would come in more colors.